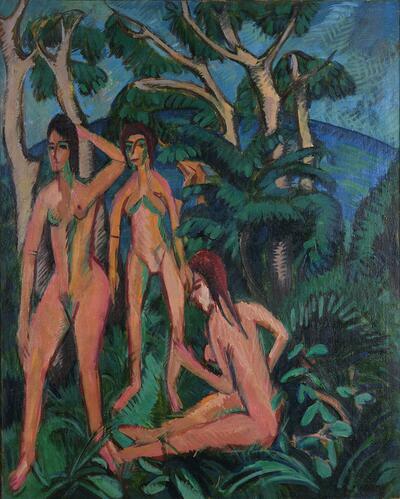 Ernst Ludwig Kirchner’s Bathers Beneath Trees is a vivid example of how this German Expressionist’s images project an aggressive forcefulness. He distorted anatomy, scale, and perspective, and used strong colors and jagged angular brushstrokes. Like Kirchner’s exotic nudes, the opulent foliage and the canopy of trees appear wild and uncivilized. Behind them, a steep blue oval horizon rears up. Kirchner’s recurring subjects are nudes, mountainous landscapes, and city streets. His paintings are directly related to his woodcuts, filled with violence and angst. Carving in wood to make these prints inspired him to reach his artistic goal. In 1905, eight years before he made this painting, Kirchner organized Die Brucke, or The Bridge, in Dresden, with Erich Heckel and Karl Schmidt-Rottluff. These earliest exponents of German Expressionism introduced modern art into Germany. They were strongly influenced by the work of van Gogh and Gauguin, and owe as much to German art, especially the late Gothic. After being drafted into the army during World War I, Kirchner suffered a nervous breakdown. He sought refuge in Switzerland, where he remained until his death in 1938. By the mid-1930s, the Nazis had labeled German Expressionism “decadent.” Kirchner’s works were under attack; many were later confiscated.